Incorporating SKF Microlog Inspector into your operator driven reliability (ODR) program helps maximize productivity while reducing energy costs and environmental impact. Companies are looking wherever they can for ways to make their operations more efficient, more productive and less costly. At the same time, they face ongoing pressures to maintain high levels of worker safety while minimizing energy costs and potentially harmful environmental outcomes. An increasing number of companies are turning to their front line operators to help them achieve these goals. Operator driven reliability (ODR) programs can help manufacturing facilities achieve higher levels of efficiency, reliability and safety, while at the same time contributing to a better bottom line and a reduced environmental impact. SKF’s Microlog Inspector system can be a powerful tool in supporting their condition monitoring efforts. Because of their proximity to equipment and assets, operators are often the first to detect even slight changes in process conditions and machinery health – such as abnormal field readings, odd noises, excessive heat, vibration, leaks, unusual pressure, and even strange odors. Through an ODR program, operators can monitor a machine’s condition, manage workflow, track safety and make regulatory inspections – all in one easy-to-use system. As a result they can make significant savings in energy usage, and prove their inspection activities have saved their company money. The SKF Microlog Inspector system is an advanced inspection system that automates paperless inspection routines, replacing and enhancing an existing data logging process for operations. User-friendly input screens facilitate accurate data recording, while alarm indicators bring awareness to abnormal conditions. SKF Microlog Inspector can be installed on most Windows® Mobile portable devices – making it a much easier communication method. 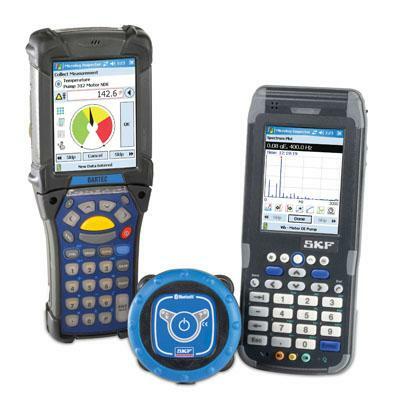 Customers can install the SKF Microlog Inspector system on multiple devices throughout their organization and download specific inspection rounds directly to the operator. Using the SKF Microlog Inspector system as part of an overall ODR program can help a facility improve overall condition monitoring activities. Together, these two elements give front line operators powerful tools for collecting, monitoring and assessing important vibration data and energy data during inspection rounds. SKF Microlog Inspector can transfer data over LAN, WiFi and even cellular data networks (3G/GPRS) to anywhere in the world for review and analysis by experienced maintenance engineers. In the past, such equipment relied on USB transfer alone. SKF Microlog Inspector’s connectivity with the SKF @ptitude Monitoring Suite provides in-depth analysis and communication of machine conditions between operations, maintenance, engineering and plant management. Compliance reporting and scheduling allows for a range of collection schedules that vary from day, week, month, day of year, and multiple or repeat collections per time period. Customizable reports identify missed, overdue, out of compliance or points in alarm. This gives customers the ability to start with an SKF Microlog Inspector system, and integrate other SKF portable and on-line condition monitoring systems as required. In addition, the SKF Microlog Inspector system can provide important support for key tasks such as work scheduling, environmental, Occupational Safety and Health Administration (OSHA) inspections, and other regulatory and safety requirements, documenting inspection data for compliance reporting and audits.